The Firefox is a Panda! I was really surprised to read the Mozilla Firefox - Brand Name FAQ since it turns out that a Firefox is not a fox but a Red panda (Ailurus fulgens). I guess it means that Foxes and Pandas are closer in the evolution than I have thought prior. WS-RX, WS-SX and WS-TX - what's the status? Many errors can interrupt a conversation. Messages can be lost, duplicated or reordered. Further the host systems can experience failures and lose volatile state. So what specifications are they working on and what's the status? Doesn't say when they expect it to be final. Here again I haven't found any time estimate for the final standards. This is the most actual with the 3 specifications listed below in Technical Work Produced by the Committee are the approved Committee Specifications that the OASIS membership is considering (throughout March 2007) adopting as an OASIS Standard. SO these could soon become final and real standards. What kind of reliability do I get with Web Services Reliable Exchange (WS-RX)? A unified standard for reliable exchange of web service messages has been missing in the WS-* family for some time, but is soon to be done (last time I heard was in mid 2006 that it was expected in December 2006). Thinking of when and where got me back to some old thoughts about what it's all about. That is do I need it? and when do I need it?, as well as the opposite answers when can i discard it? Here's my (non expert) thought on that. On the one hand it seems obvious that it should always be reliable, because why should I make something that doesn't always work? On the other hand so much has been running nicely for so long without these painful thoughts (based on a risk assessment or simply being optimistic and pragmatic. That's taken that I even know what I mean when i write reliable and even more what others mean by it. The term has meaning all through the architecture layer, from the business level of an reliable business partner, to the process level with reliable processes (sub and super processes), down to the reliable messaging and protocols that ensure that. The decision as to the need for reliability has to come from the business needs, but I guess that there are aspects or facets that could make the different layers realize this in different ways, with the proper decoupling between the layers. It seems natural that the baseline does not involve reliability and to get reliability an effort has to put into it. How big an effort and what measures does it account for, that is what potential problems and error cases does it resist? The quality of being reliable, dependable, or trustworthy. A quality of a measurement indicating the degree to which the measure is consistent, that is, over repeated measurements would give the same result. In general, reliability (systemic def.) is the ability of a system to perform and maintain its functions in routine circumstances, as well as hostile or unexpected circumstances. The IEEE defines it as ". . . the ability of a system or component to perform its required functions under stated conditions for a specified period of time." The first thing i think of when associating on reliable messaging is JMS. A quick googling lead to the Novel JMS FAQ the question is messaging reliable? While the quality-of-service guarantees offered in Message Oriented Middleware solutions can vary greatly, and while real-world reliability often depends on administrative issues (such as cluster size and available resources), all JMS-based messaging services are required to offer assured, once-only delivery of messages as an option for applications where reliability is paramount. JMS also allows for configurations that provide a less robust quality of service, so that in cases where speed of delivery might be more important than assured, once-only delivery, a tailored solution can be built. The reliability of JMS-based messaging solutions is thus configurable. Enterprise messaging products (or as they are sometimes called, Message Oriented Middleware products) are becoming an essential component for integrating intra-company operations. They allow separate business components to be combined into a reliable, yet flexible, system. Some messaging systems provide synchronous delivery to destinations as a mechanism for implementing reliable applications. Some systems provide clients with various forms of delivery notification so that the clients can detect dropped or ignored messages. This is not the model defined by JMS. JMS messaging provides guaranteed delivery via the once-and-only-once delivery semantics of PERSISTENT messages. In addition, message consumers can insure reliable processing of messages by using either CLIENT_ACKNOWLEDGE mode or transacted sessions. This achieves reliable delivery with minimum synchronization and is the enterprise messaging model most vendors and developers prefer. JMS does not define a schema of systems messages (such as delivery notifications). If an application requires acknowledgment of message receipt, it can define an application-level acknowledgment message. These issues are more clearly understood when they are examined in the context of Pub/Sub applications. In this context, synchronous delivery and/or system acknowledgment of receipt are not an effective mechanism for implementing reliable applications (because producers by definition are not, and don’t want to be, responsible for end-to-end message delivery). so it's up to the application level if further receipts are needed. So it's the same thing as JMS, we want to avoid duplicated or 'wrong'-ordered messages and of course loosing messages. The WS-ReliableMessaging specification defines an interoperable protocol that enables a Reliable Messaging (RM) Source to accurately determine the disposition of each message it Transmits as perceived by the RM Destination, so as to allow it to resolve any in-doubt status regarding receipt of the message Transmitted. The protocol also enables an RM Destination to efficiently determine which of those messages it Receives have been previously Received, enabling it to filter out duplicate message transmissions caused by the retransmission, by the RM Source, of unacknowledged message. It also enables an RM Destination to Deliver the messages it Receives to the Application Destination in the order in which they were sent by an Application Source, in the event that they are Received out of order. Note that this specification places no restriction on the scope of the RM Source or RM Destination entities. 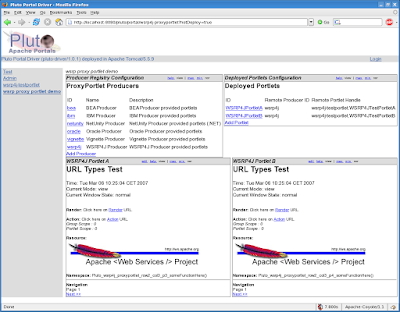 For example, either can span multiple WSDL Ports or Endpoints. The same story with more words and som abstract source and destination semantics. The protocol enables the implementation of a broad range of reliability features which include ordered Delivery, duplicate elimination, and guaranteed receipt. The protocol can also be implemented with a range of robustness characteristics ranging from in-memory persistence that is scoped to a single process lifetime, to replicated durable storage that is recoverable in all but the most extreme circumstances. It is expected that the Endpoints will implement as many or as few of these reliability characteristics as necessary for the correct operation of the application using the protocol. Regardless of which of the reliability features is enabled, the wire protocol does not change. I'm not really sure if the guaranteed receipt is an addition comparing with JMS, since I guess it's implicit in the specific JMS implementations. The Java Messaging Service API (JMS) is widely adopted, but this doesn't offer an interoperable wire protocol. So you can't talk from one vendor's JMS implementation to another without some kind of bridging in the middle. The other key difference is that WSRM doesn't require you to change your programming model. Because SOAP is already a message based model, you can add reliability in without having to think about concepts such as queues and topics. The result is that WSRM can be very easy to implement if you already have a SOAP or XML based architecture. This is more an overall architecture answer, but i guess the meaning in terms of reliability is that they are very much alike. I hope it's possible to access the start og end date (year or month). I've just upgraded to Firefox2 (Danish version) by following a hint on how to upgrade by yum over at www.linuxquestions.org which was surprisingly easy, glad that I did that search prior to just going for the tarball. Certain changes has to be done to the template to ensure that the it resolves to valid XHTML 1.0. Use external style sheets if your style sheet uses < or & or ]]> or --. which is the case here, but since the template stays as one file this ends up invalid (blogger should just split it into a custom css-file (there are plenty of them already). To eliminate this problem I have two options, one is to embed it in a comment section. Therefore, the historical practice of "hiding" scripts and style sheets within "comments" to make the documents backward compatible is likely to not work as expected in XML-based user agents. In my former post called Valid XHTML - blog post I wrote about the trouble I had with creating (XHTML) valid posts. After having thought some more about it and worked with ajusting the template I realized that maybe there is a much simpler and obvious solution - fixing the template! Uhmm, that's real easy to change and I can't understand why the template is like that. This leads to another question that I've been thinking about Are all the template markup the same? , which can be rephrased as are all the customization done with CSS and the related variables? This template is Minima Blue and changing template to Minima Stretch didn't change this but that's not a real good testcase since part of the template magic is that the widget's and their configuration stays eventhough the template is changed. I had to try another blog so i picked the next one which turned out to be Eric Hill's who's using Rounders 3 and it's just the same, so I'll conclude that it's a general configuration and a general bad idea :-). I'll try changing it another day, but not right now when I've rewritte the post markup of several of my postings. I will then change permanently to Minima Stretc because it's simpler and easier to read black on white and not the least because it stretches to screenwidth. I googled for some help but didn't find much and most of my findings were either for the old version of blogger.com or regrets that it still wasn't valid XHTML we are in the year 2007, more than 7 years after the first recommendation for XHTML. and it works nicely in firefox also when it's inserted in the header for a shortcut icon . The navigation bar is not part of the template but is inserted serverside. When i started validating the navigationbar (navbar) gave some of the errors. I don'y not mind the navigation bar since it's sort of fair that the blogger.com brand is on the page and it has some practical links - I just wanted it be valid XHTML 1.0, and frankly I was very surprised that it wasn't, since it's quite easy to fix and affects all blogs, and not the least the rumor has it that the search engine Google loves wellformed and maybe also valid documents ;-). The name of my blog is Sweetxml, but I don't see why it's needed as a paramter in the URL since it should be trivial to lookup based on the targetBlogID. Don't knwo what this means but probably it beacause I use the online editor and not FTP? The background color I think, haven't had time to experiment with it. Don't now what it means or if it's really needed. Error  Line 409 column 100: there is no attribute "src". Error  Line 409 column 390: there is no attribute "height". Error  Line 409 column 403: there is no attribute "width". Error  Line 409 column 422: there is no attribute "marginwidth". Error  Line 409 column 439: there is no attribute "marginheight". Error  Line 409 column 453: there is no attribute "scrolling". Error  Line 409 column 461: there is no attribute "id". Error  Line 409 column 489: there is no attribute "frameborder". Error  Line 409 column 492: element "iframe" undefined. style="height: 30px; width: 100%; margin: 0px; overflow: hidden;"
Your browser could show this page as an object, click on this link to see the<a href="http://www2.blogger.com/navbar.g?t...h">navigationbar</a>. Now how do I replace the invalid version with the valid one? Since I can't change anything on ther serverside direct, it will have to be through the template. I did some googling, and ofcourse others have tried the same, one of the hits were from the forum. Most of the hits showed how to hide the navbar through css and with some considerations as to wheter is was okay or against the rules. As for the rules it's not clear since if yuo post though FTP it doesn't have to be there, as it say's on one of the help page about the navbar Unless you publish your blog via FTP, the Navbar cannot be disabled , not that i understand why. So the navbar is inserted as a template in part of a two step process. This makes a valid reference to the navbar but what about the markup in the navbar itself. I can't really understand why it's implemented as an iframe that reference another (X)HTML document since in my view it could easily have been implemented right in the page, instead of dereferencing i through an iframe, but there must be some architectural idea to it or maybe just an architecture decision at some point :-). Maybe I'll have a look at the actual markup in another posting. and voilá it's there. I had to google for the needed markup. I would prefere to place the favicon external on ex. picasa, but since it only accepts jpeg and gif that's not an option. I don't think it's a real problem since it'll probably be cached by browsers and shown when my server is offline. Wikipedia has a nice description of Favorites Icon. but in the blog post the line breaks are introduced again. I looks like it time to investigate some of the other options for posting. Maybe the last bullet does imply that what I'm doing is not what should be done if I exposed it, but since I'm only consuming at therefore use to generate my stubs it doesn't really matter. Work in slow progress Following the README with the WSRP4J dist I succeded in getting the demo running and heres a dump of the web traffic it generates as captured with the tcpmon tool. The traffic is between the wsrp4j proxy portlet and the wsrp4j-producer (forwarding the jsr168 testportlet that comes with wsrp4j). The portlet page that these (identical) portlets end up in looks like. which is kind of an no-answer since it just indicates the it requires registration prior to any thing (requiresRegistration), and that it requires that cookies are initialized per group (requiresInitCookie) more about that later. so the registrationHandle is 0:0:0:0:0:0:0:1_1173173104036_0. and here goes the answer which is quite verbose since it contains a complete description of the portlet/service. One annoyiance is all the unnessesary xsi:type the Axis 1. * produces which I've never been able to remove not even with sendXsiTypes. and the are actually the same portlet, that is portlet code but exposed twice to show of som IPC (Inter Portlet Communication) within a portlet group (portletapplication). I don't understand why it's done this way since it's all webservice and not (legacy) browsers, so all clients will be WSRP aware, but I guess the spec writers wanted to stick with known protocols where possible, so the session handling between the consumer and producer uses normal HTTP cookies. Now discovery and initialization is done and the markup can be exchanged. and the same for the other portlet (ending with B). and that completes the portlet page that the user sees.